Norway’s new leadership is urging councils across the country to ban begging on the streets as it tries to force Roma immigrants out of the country and tackle rising crime. The Conservative-Progress Party coalition government said in a joint statement on Monday, they will ‘allow municipalities to impose a ban on begging in their local police regulations, in order to combat human trafficking and other organised crime’. 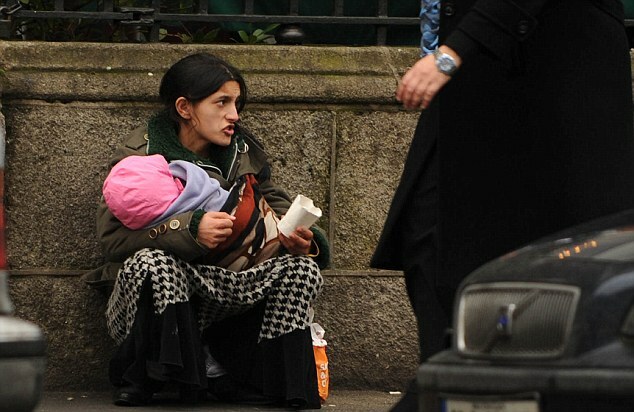 Leader of the party, Siv Jenson, told The Local before the election that a national ban on begging was ‘the best way’ to reduce the number of Roma on the streets. She said that the problem was far greater than people simply begging in the streets and extended to increasing rates of petty crime. ‘We see this throughout the country and its growing, and its growing rapidly,’ she said. Increasing problems surrounding Roma immigrants have been reported across Europe. In Paris this week, gangs were filmed working together to rob unsuspecting people at cash points. Police in the French capital also believe an organised crime gang from Roma are responsible for an axe-wielding heist of a jewellery store at the weekend, in which £1million worth of Swiss watches were stolen. Five Eastern Europeans have been arrested. Roma gypsies are known to frequently set up camp in some of the most exclusive London addresses and police are routinely removing them from Park Lane and leafy squares around Mayfair and Oxford Street. They are known to beg, which has been theoretically illegal in the UK since 1824, but are also blamed for increases in petty crime such as theft of cash and mobile phones. Even Romania’s prime minister, Victor Ponta, has admitted that Roma crime is a problem in Britain and said it was ‘fair’ that David Cameron plans to tighten laws that allow migrants to claim benefits.